An action plan has been developed to help both cultivate lawns, plants and trees, and protect and promote wildlife in Manchester’s private outdoor spaces following an evaluation of green space by university researchers. The My Back Yard project has helped not only residents but also Manchester City Council, social landlords, environmental bodies and ecological charities better understand what contribution domestic gardens and yard spaces make to the city’s environment and co-create a strategy with partner organisations to improve their performance. Researchers at Manchester Metropolitan University invited city residents to answer an online survey about their outside spaces, including how much of this is green space - trees, grass and plants - and how valuable they are considered. After more than 1,000 people took part in a survey, the academics corroborated the answers by studying detailed aerial images and extrapolating the results to cover the whole city. The project then estimated the natural processes (including cooling the air and absorbing rainfall) that take place in gardens to indicate the benefits relating to reduced risks from heat waves and flooding. This new information was incorporated into an action plan to improve the benefits provided by gardens. The university team discovered Manchester City Council’s previous estimate that 58 per cent of Manchester’s land was green space and water had been overestimated, because gardens are not wholly green. 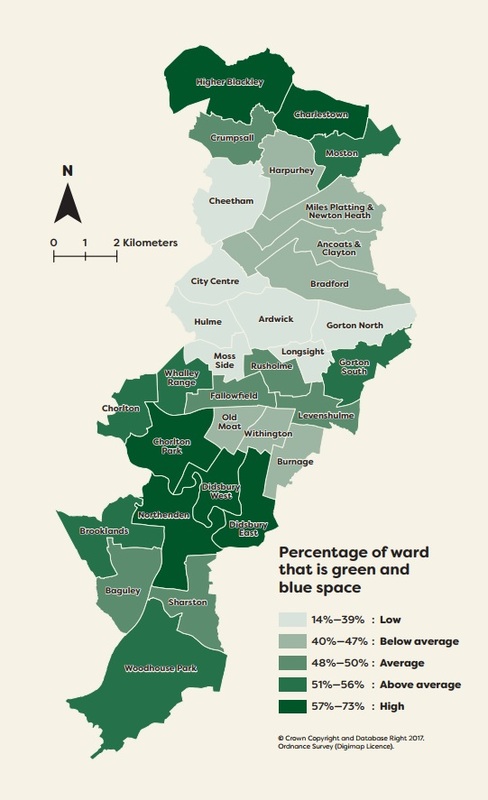 The research found that in fact green and blue spaces cover 49 per cent of Manchester because some gardens have been wholly or partly paved over for driveways and patios or lost to the construction of new buildings and sheds. Dr Gina Cavan, Senior Lecturer in Geography at Manchester Metropolitan University, said: “The actual amount of green and blue space within Manchester’s gardens and back yards is less than expected. Since these private spaces account for around one fifth of Manchester’s area, this makes a dent in the overall green space in the city. "Green space provides important benefits to the city, particularly in reducing climate risks like the urban heat island – the phenomenon where urban areas experience elevated temperatures relative to the surrounding rural hinterland - and flooding, and since the quantity of green space is less than previously thought, we are not as resilient to those risks as initially thought. "There is a lot of untapped resource in back gardens that we are not currently using and that has an impact on the neighbourhood and the ward because such a cumulatively large area of land is privately owned gardens. In fact, with their private gardens, the city’s residents are responsible for around 20 per cent of the green and blue space. “We called the project My Back Yard because we are interested in all outdoor space, not just green gardens. “In Manchester we have so many tiny back yards that people may not even consider to be a garden, but it’s all part of Manchester’s outdoor space. “If you look at a single back yard then you may think you cannot make a difference because it is such a small area but if you add up all the outdoor space in a single council ward, it can amount to half the ward’s area. “That is where and why we really need to think much more about our garden spaces and how we can improve them." Dr Cavan said: “There’s examples of good work going on in Rusholme and Moss Side where they are greening the alleyways between houses. More than 100 survey respondents took My Back Yard pledges to improve their greenery and wildlife by planting a variety of plants, introducing drought-resistant plants, collecting and reusing rainwater, planting trees to create shade and improve air quality, and replacing hard surfaces in their gardens with green space. These actions all help to make Manchester more resilient to climate risks and help to boost wildlife. Project partners Manchester City Council, Lancashire Wildlife Trust, Manchester City of Trees and Southway Housing Trust agreed as part of the action plan to deliver a string of individual and collective activities in some or all of the wards that they hope will encourage households to cherish and green their outdoor spaces. This includes working together to promote the value of gardens among citizens; protect, conserve and remediate existing and void gardens in their housing supply; and create appropriate new gardens in new developments. 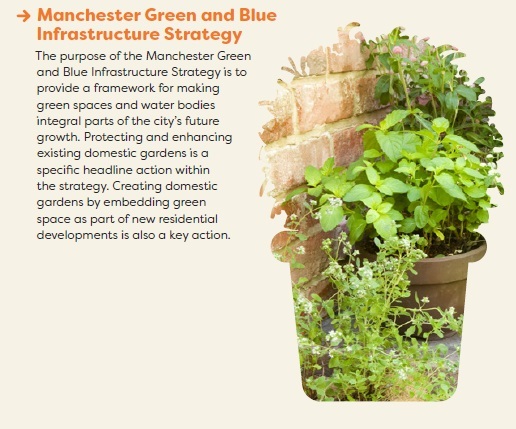 Dr Cavan said: “One of the policy outcomes is that we will have a new garden section in the updated Manchester Green and Blue Infrastructure Strategy and this will include our partners’ commitments. The My Back Yard research found the more green space there is in a garden, the more the resident valued that land and that if a garden is 60 per cent or more green space, then they tend to value the space ‘very highly’. Respondents in older age groups valued their gardens more than those in the younger age groups and tended to have more greenery in their gardens as a percentage of the available space. 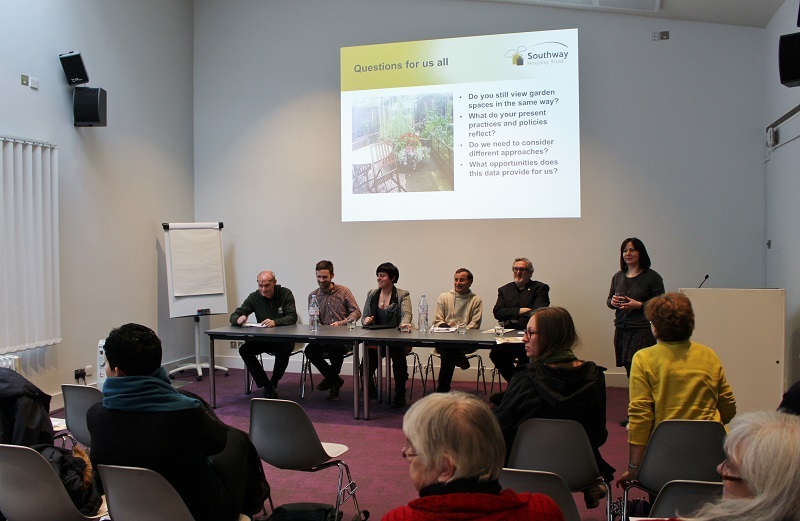 Private rented tenants said gardens were not a key factor in deciding whether to rent a particular property and it was this group that reported the lowest amount of outdoor green space. Dr Cavan said: “We have a large private rented sector in Manchester so if tenants are not particularly bothered about having gardens then landlords are not going to grass them and maintain them. Manchester City Council’s Executive Member for the Environment and Skills, Councillor Angeliki Stogia, said: "The My Back Yard project highlights the huge importance of gardens, which are a real source of pride to Mancunians and also home to a rich range of wildlife. “Manchester Metropolitan University's important research will encourage everyone across the city to continue to celebrate their gardens and recognise the vital role that they play in our daily lives." The Lancashire Wildlife Trust’s Senior Project Officer for Manchester, James Hall said: “There has certainly been a loss of garden space in Manchester and this will obviously affect wildlife in the city. My Back Garden will mobilise Mancunians to provide food and shelter, creating new corridors for wildlife. “We have an active education team which is getting young people interested in urban wildlife and we are developing initiatives with Manchester City Council to promote the importance of gardeners and support Mancunians trying to make a difference. The My Back Yard project was funded by the Natural Environment Research Council and led by Manchester Metropolitan University.